What's sweeter and cuter than candies? Yeah, nothing, you're right! So today is a cute candy day~! Candi mani with Show It And Glow It! for the glitter part and Guy Meets Gal-Veston for the sorbet effect! In fact, I saw a "candy mani" on Polish This last week, a blog where the owner likes layering different nail polishes to achieve different effects! If you don't know this blog, I suggest you go and visit it! 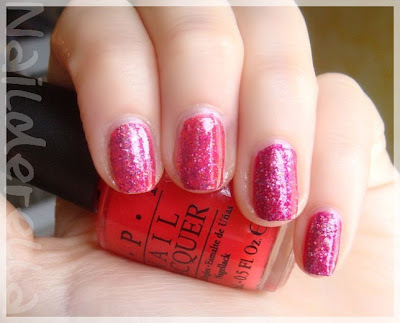 And I've also just seen this kind of mani on Tera's blog, Nails in Nippon. She did an awesome orange combo! 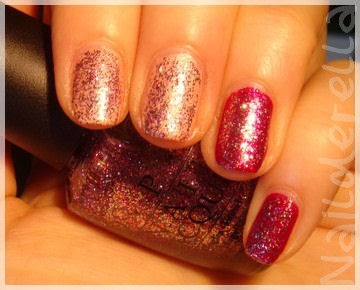 So basically, you need a colored base coat, a glitter nail polish and a jelly or sorbet polish to use on top. So for the first step, use a colored base coat. I used 2 coats of OPI Tutti Frutti Tonga on my index and middle finger and 2 coats of OPI Let Me Entertain You on my ring finger and pinky. Of course, you can do all your nails with the same color! Here I wanted to experiment with this kind of mani to see what looked best! 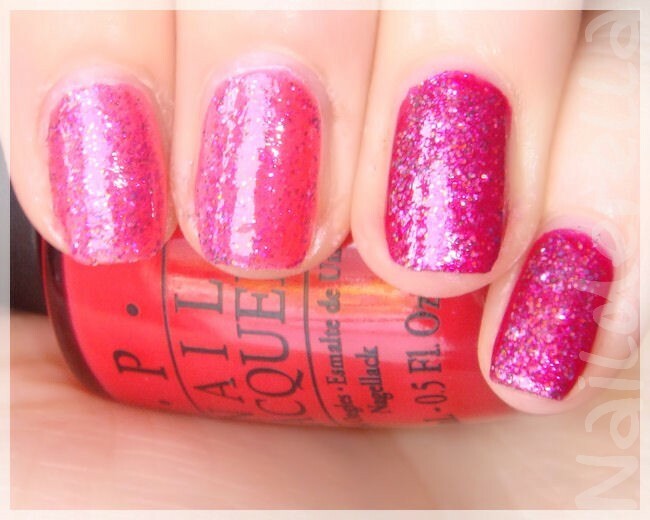 Ring finger & pinky : 2 coats of OPI Let Me Entertain You on my ring finger and pinky. Second step involves glitters! Yay! ;D Here I layered 2 thin coats of OPI Show It And Glow It! (purple glitter nail polish) over the colored base coats. Finally, add your favourite jelly/sorbet on top! I chose OPI Guy Meets Gal-Veston, a coral sorbet. It's so juicy! I really feel I have candies on my nails! It's really bright and funny! It pops! 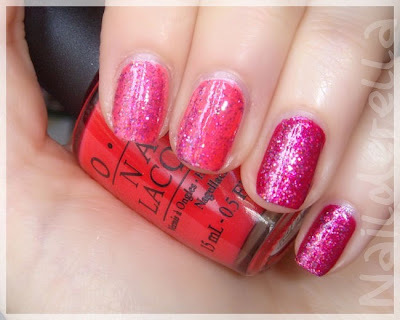 Sorbets are known to be really shiny on their own and it's what gives this mani a candy-look! Left: very light coral base - right: dark and sparkly fushia base. Blurry picture to catch a glimpse of the glitters. In real life, it's a 100 times sparklier! What do you think of Candi manicures? Do you like this look? If you missed the glitters from the Burlesque Collection of OPI (Holiday 2010), don't worry, OPI will be releasing a glitter collection for this winter! It's the Muppet Collection! It seems there will be great glitters this winter, too! Oh, BTW, I created a Facebook page for Nailderella. You can like it if you're willing to! ;D I put a link on the left side of my blog. Gorgeous mani. I like the Tutti Frutti Tonga a lot ! Interesting take on the jelly sandwich! I've heard Let Me Entertain You is a close twin to Katy Perry's The One That Got Away so if any readers can't get LMEY, TOTGA is gorgeous itself :). I loved Teras mani, and I love yours too. I just wish my try on this succeeded :D I'll keep on trying. The effect is just too nice. love what you did here! :) never heard of the candy mani..now VERY interested in trying this!! Kayono, if you're please with your candi mani, let us know how it turned out! ;D I wanna see it! The Bookworm, yeah, it does really look like candies! That's funny to do! Give it a try! Annie, thank you! Yeah, layering different polishes can give really surprising and fun results! Awesome Candy Mani! I love it with Let Me Entertain You, so shiny, and thanks for shouting me out! Anything that involves glitter, always looks fabulous! This mani could be no exception! Awesome post! 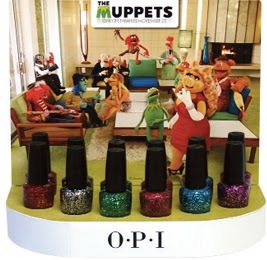 I love that you used OPI candy collection! 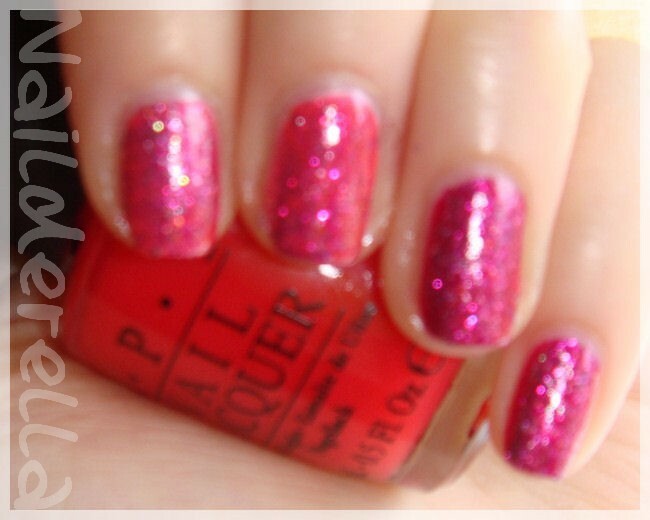 Thanks for stopping by to read the interview with OPI creative director! Your comments mean a lot to me! Tera, thanks! yes, LMEY is really beautiful! I like it! Erin, you're welcome! Your interview was very interesting! Hard to pick a favorite. They are all so gorgeous!